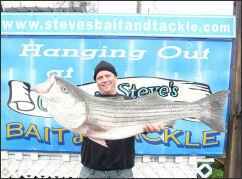 Captain Steve's Bait and Tackle is your source for Chincoteague Island fishing tackle, bait and equipment. We specialize in surf, bay fishing (esp. 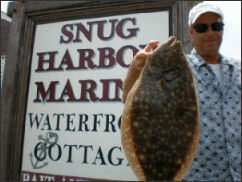 flounder) , and offshore fishing and we carry a wide selection of rods, reels, lures and tackle for all local fishing needs. Here at Captain Steve's we also carry a variety of custom made rigs which have been proven for years. Our East Coast Flounder rigs have been our most popular rig for around 10 years now. Our custom made Assateague Mod. fishfinder rigs have been the go to rig for big fish off the surf. Swing on in and let our family help you have your most enjoyable fishing experience. Capt. Steve's is your saltwater outfitter for surf fishing, bay fishing and offshore fishing! Snug Harbor Marina has a large fleet of boats for rent . Snug Harbor offers Carolina Skiffs, Bentley pontoon boats and Old Town canoes and kayaks. Chincoteague Island is one of the most incredible places you will ever visit and if you want to get the best experience and see all Chincoteague has to offer, you must be in a boat. The name Chincoteague is an Indian name that means beautiful land across the water and the only way to see what the Indians did is tour the islands by water, just like the natives.